Zao National Park on the Yamagata-Miyagi prefecture border, is a mountain park centering around the Zao mountain range. 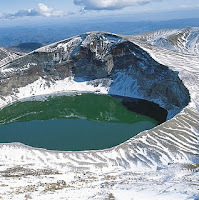 You can enjoy the beauty of the nature when you visit the mysterious Okama crater lake which is also called Goshiki-numa (five-color marsh) since its water color changes several times in a day, and Zao Shizen-shokubutsu-en or (botanical gardens), a treasure house of alpine plants. Aboard the rope way car, you can get a bird’s eye view of the whole of the Yamagata Basin. You can also enjoy a night view and a starry sky from the lodge or inns. Did you know? That there are 28 National Parks in Japan . While about two thirds of the land area in Japan is composed of forested areas and roughly 80% of the terrain is mountainous, it is no wonder that there are many beautiful National Parks with diverse geographic features located all over Japan . National Park areas cover 5.4% of Japan‘s total land area. But Zao National Park is considered to be one of the best Park because of its stunning beauty.